Samsung Display announced that its unbreakable smartphone panel has been certified Underwriters Laboratories (UL), the official testing company for the Occupational Safety and Health Administration of the U.S. Department of Labor. This display was first demonstrated at SID 2018. This display is not aimed for just smartphones - SDC sees it being used in the automotive market, the defense market, portable game consoles and tablet PCs. The display is a flexible AMOLED on an "unbreakable" substrate with an overlay plastic window securely adhered to it. Researchers from Penn State University have demonstrated 3D OLED lighting devices, inspired by the Japanese Kirigami art of paper cutting the folding. The researchers started with flexible OLED lighting devices produced on thin plastics, which they then cut and folded to create lighting-emitting 3D structures. 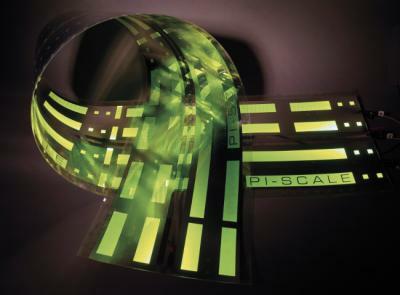 In March 2016 the EU launched a new project, called, PI-SCALE, that aims to create a European-wide pilot line which will enable companies of all sizes to quickly and cost effectively test and scale up their flexible OLED lighting concepts and turn them into market ready products. 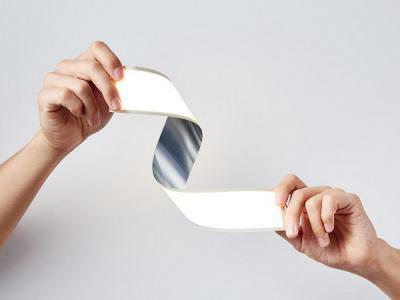 As one of the core-founders in this project, the Fraunhofer FEP is soon set to present the first demonstrators of flexible OLED out from this project. 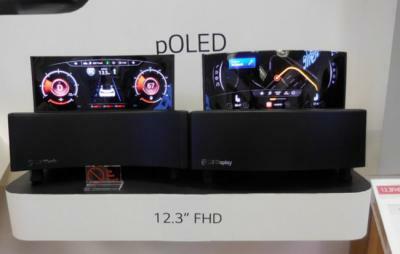 The OLED prototype you see above was deposited using a roll-to-roll by Nippon Electric Glass, on an ultra-thin glass. Back in 2014 LGD said they already signed contracts with several German automobile makers - it'll be interesting to see how soon will such display be adopted in commercial cars. Motorola is set to unveil new phones on October 27th, and according to leaked brochures, the Droid Turbo 2 phone will have a "shatterproof" screen - Motorola will even accept trade-ins with phones that have cracked screens - just to emphasize this new feature. It's not clear what does a shatterproof screen actually means - but it may be that the new phone uses a plastic-based flexible OLED. Up until now all phones that adopt a flexible OLED actually use a cover glass which makes them as shatter prone as any other display... it's not likely but perhaps Motorola uses a new flexible OLED that has no glass at all? The first-generation Apple Watch uses a flexible OLED display, exclusively produced by LG Display. New reports say that Apple signed up Samsung Display to be the second flexible OLED supplier for the next-generation Watch. This is actually quite funny - even before the official launch of the Watch in March 2015, we heard the same report. Later on it was said that Apple decided to make LGD the exclusive flexible OLED display supplier for the Watch 2. And now we're back to the first report with SDC as a supplier. AU Optronics demonstrated a new 1.3" Full-circle plastic-based flexible AMOLED panel. The panel features a resolution of 320x320 (257 PPI) and a brightness of 320 cd/m2. The whole panel is less than 0.25 mm thick. It's not clear how close is this panel for commercialization. AUO recently shifted its focus to wearable OLEDs, and has launched a circular 1.4" glass-based AMOLED display. Currently LG Chem offers samples for $250 each, and mass production of these panels is expected by July 2015 - which will also mean a lower price. Those panels offer 60 lm/W, 75 lumens, a color temperature of 3,000K and a CRI of over 85. The bending radius is 30 mm. Earlier this month, Samsung Electronics reported high demand for their Galaxy S6 and its curved-display variant the Galaxy S6 Edge - in fact the GS6 Edge received 5 million orders (from mobile carriers, not final customers). Now we hear reports from Korea that Samsung Electronics may decide to increase the GS6 Edge output - in fact they may want to triple the planned production, as they think the GS6 Edge may sell as many units as the 'regular' GS6.